The tropical yellow fruit pineapple contains the enzyme bromelain, which is helpful in treating muscle injuries like sprains and strains. 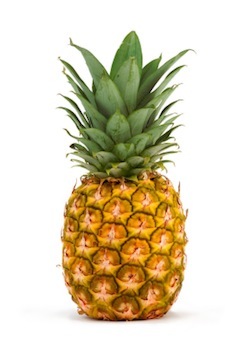 Bromelain, the key enzyme in pineapple, can treat inflammation as effectively as some drugs. Bromelain reduces edema, bruising, pain, and healing time following trauma and surgical procedures. And research is now showing that bromelain and pineapple are highly effective when using chemotherapy for cancer. According to a study, this enzyme may also help to improve digestion along with aches and pains associated with rheumatoid arthritis. Add pineapple to a smoothie or salad to help improve your body's tweaks and twinges.